Cupcakes 'n Daisies: A little something on the side . . . Remember those charm packs I picked up from the Primitive Gatherings booth at the Road to California Show? Google charm pack quilt blocks and you get thousands of ideas, here's what I've decided to make. Using two like charm squares (5 inch squares) and some background fabric I'm able to make two 3 inch finished churn dash blocks! One 5 inch square of fabric and one 5 inch square of background fabric can make the 8 half square triangles. then sew a 1/4 inch seam on each side of the line, make four cuts; on the drawn lines and each side. These units can be squared up to 2 inches. but I decided to go smaller, mine are 1 1/2 inches. This amount of waste might bother some folks, but not me. From another charm square cut 3 one inch strips. I'm going with like fabric but you could mix it up if you wanted. Sew a 1 inch background strip to a red strip and cut into 1 1/2 inch strips. Add a 1 1/2 inch square of background fabric for the center and you have all the pieces you need to make the block. 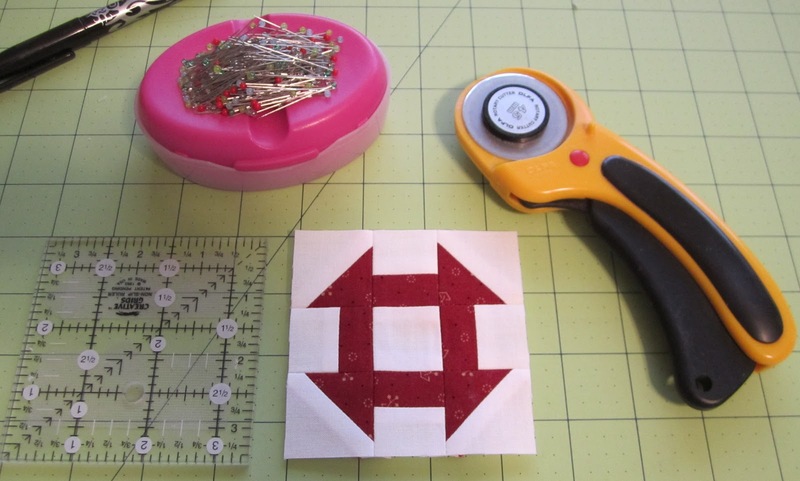 A friend mentioned to me that you could make negative positive blocks, there is enough red fabric remaining from the second square to cut a 1 1/2 inch center. Right now my plan is to make all my blocks using the same background fabric, they may all be red, maybe not. I have no plans for a setting I'm just going to make blocks whenever I'm in the mood. I don't think you can appreciate how cute this block is unless you can grasp its size. I've made 4, I think I need at least 100 to make anything worthwhile. I sure hope this goes better than my yo-yos! Beside piecing churn dash blocks I'm trimming my 600 half square triangles for 3 Barns. That's going pretty well too! Cute blocks and I like how you made the HST's - thanks for showing us. I plan to demo that to my club! Love your Churn Dash blocks and thanks for showing us how you made the HSTs. I would not be able to make the 600 HSTs at one time. 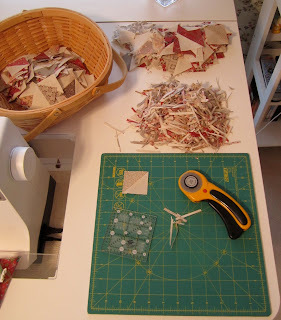 I would have to sew some blocks for the Three Barns quilt, then cut more blocks, etc. Wish I worked like you did! I've always wanted to make a churn dash quilt, but it just hasn't made it to the top of my To Do list. It will be really nice when its done. Ok. When you mentioned these in passing I could not visualize them this small. Crazy small!! Soo cute. I was just over @ Nicole's blog and she was talking mini quilts and after making a 'bite' and I got bit and made a few by Tara Lynn Darr. She has a book called Simply Charming that is full of sweet mini goodness. I can see those in a lovely mini... OR a border for some bigger medallion quilt. omg those are tiny. Think a little to small for me! Always love seeing what you make. I am off to my quilting space to tackle FMQ borders. Those teeny churn dashes are incredibly cute! I love the one with the red background. Wee blocks! I like the postive/negative look. But too tiny for me. I would make, oh, 4 blocks and get bored with the thought of 96 more blocks ahead of me! You're right - they are so tiny and so cuuuute! Those little blocks are terrific. So is the red/white combo! I predict you will have more success with these than with your yo-yos. They're just so much more YOU! And what speed -- you have your 600 HSTs cut and sewn already. Happy trimming! Thanks for the tutorial! I have been wanting to do a giant churn dash block that I saw on another blog (http://elvycrafts.blogspot.com - look for churdash in the tags), but combined with your tiny ones - that could really accent one another. I will have to sketch something out I think! I have lots of charm packs that I could put to good use this way! Great tutorial and fun cute little tiny blocks! I don't know if I would have the patience for 100 of those, but I'm so excited to see your progress! What a great little tutorial for us! Churn Dash has always been a favorite of mine, but never that little! Oh great... something else to add to the "to do" list! I'm blaming you, Thelma! There are churn dash blocks appearing all over blogland at the moment! I've made two different sets for bees! I love them, and thank you for your tute! Oh how fun and cute! I have tons of 1.5" units from double sewing units. I was joing them to make flying geese...however, this is so much cuter! Wonder how totally scrappy and with various backgrounds would look? I like these little churn dash blocks. Thanks for showing how you made them from charms. I look forward to seeing your final creation. Thanks for the ideas of making 8 hst at once! So time saving. These are cute little blocks and didn't realize till you mentioned the size.......really, really small and cute as a button. Thank you sooo much for this great way to use charm packs! :O) I love making things that can be squared up and this is going to be a fun block!!!! Super cute Thelma! Must try these.